1745 Switzerland medallic 20-ducat, graded AU-58. Realized: $84,000. NGC-graded coins were featured prominently at Stack’s Bowers auctions in New York. NGC-certified gold rarities from 18th century Europe were among the highlights in a pair of coin auctions by Stack’s Bowers held in New York on January 11 and 12. A 1745 Switzerland medallic 20-ducat, graded NGC AU-58, realized $84,000, well above its pre-auction estimate of $45,000 to $60,000. With an impressive diameter of nearly 49 millimeters, the gold piece may have been struck for a dignitary. 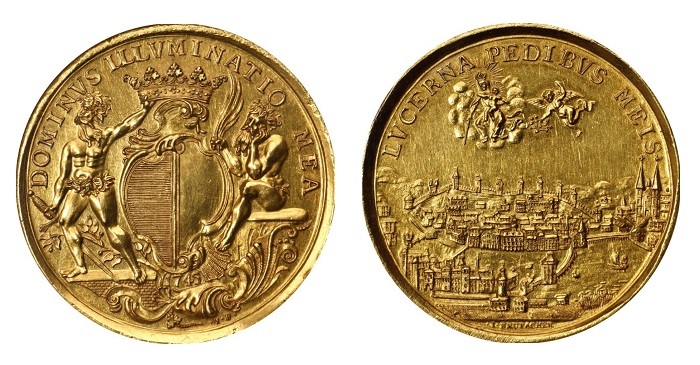 The obverse inclueds a coat of arms while the reverse shows the city of Lucerne. Lot 40245 — 1721 Germany eight-ducat, graded NGC AU-55. Realized: $78,000. Lot 41399 — 1798 Switzerland eight-ducat, graded NGC MS-63. Realized: $57,600. Lot 41402 — 1694 Switzerland Pistol, graded NGC AU Details. Realized: $48,000. Lot 41020 — Lydia Croesus (561-546 BC) Gold Stater, graded NGC Ancients AU, 5/5 Strike, 5/5 Surface. Realized: $40,800. Lot 40237 — 1611 Germany Goldgulden, graded NGC EF Details. Realized: $33,600. Lot 40043 — 1727M Brazil 20,000-reis, graded NGC MS-64. Realized: $26,400. Lot 41386 — 1568/7 Sweden daler, graded NGC AU-53. Realized: $20,400. Lot 40205 — 1889A France gold five-francs, graded NGC PF-64 Ultra Cameo. Realized: $18,000. Lot 40220 — 1550-79 Germany ducat, graded NGC EF-40. Realized: $18,000. Lot 40240 — 1811 Germany two-ducat, graded NGC MS-62. Realized: $17,400. Canada 1898 $1, graded PMG-66 Gem Uncirculated EPQ. Realized: $25,200. Canada 1907 $50 Specimen, graded PMG-53 About Uncirculated. Realized: $19,200. Staits Settlements 1925-27 $100, graded PMG-30 Very Fine NET. Realized: $18,000. Canada 1845-55 $1, graded PMG-25 Very Fine. Realized: $16,800. Colombia 1923 500-pesos Oro Specimen, graded PMG-55 About Uncirculated. Realized: $15,600. Palestine Currency Board 1927-1944 10-pound specimen, graded PMG-64 Choice Uncirculated NET. Realized: $14,400.